Dicentra are shrubby hardy perennials. They range in size from 7 to 60 cm in height and depending upon the species. They come into bloom anytime from the beginning of spring to the end of summer. They have a foliage that is almost fern like and delicate flowers of pink or white. Some of the common names for Dicentra include Bleeding heart, Lady in the bath, and Dutchman's breeches. Dicentra Photograph by Golbenge (골뱅이). 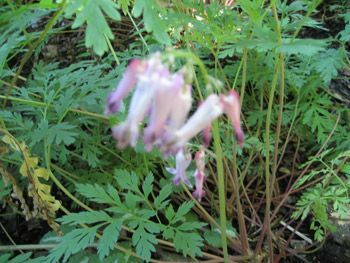 Common Names: Bleeding Heart, Dutchmans’ Breeches, Komakusa, Squirrel Cone, Lady In The Bath, Longhorn Steer’s Head, Turkey-corn. Height: 3 to 24 inches (8 to 60 cm). Flowers: Species dependent: Early spring and/or summer. Flower Details: White, pink, red. Hearts. Four petals, two sepals. Clusters. Foliage: Herbaceous. Basel rosette. Dissected. Fern-like. Heavily lobed. Roots: 2 to 3 inches (5 to 8 cm). Towards the end of autumn and the first month of Winter. Spacing 12 to 24 inches (30 to 60 cm). Seeds: Cover. End of autumn through to the first month of Winter. Sow Inside: Middle of Summer. Germination time: one month to one year. Temperature 55 to 60°F (13 to 16°C). Mix seeds in a moist growing medium, place in a freezer bag, then stratify by freezing for six weeks. 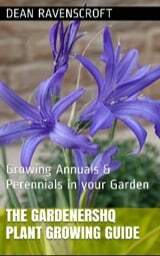 Transplant outdoors in spring or in autumn. Requirements and care: Full sunlight or partial shade. Soil pH 5.0 to 6.0. Rich soil, moist soil, light soil. Regular watering. Occasional light feed whilst growing Dicentra. Cut back once flowering has completed in hot regions. Vigour can be maintained by dividing every three years. Propagate: Root cuttings. Or by dividing at the start spring. Miscellaneous: The seeds of members of the Dicentra genus such as Dutchmans’ Breeches are spread by ants. 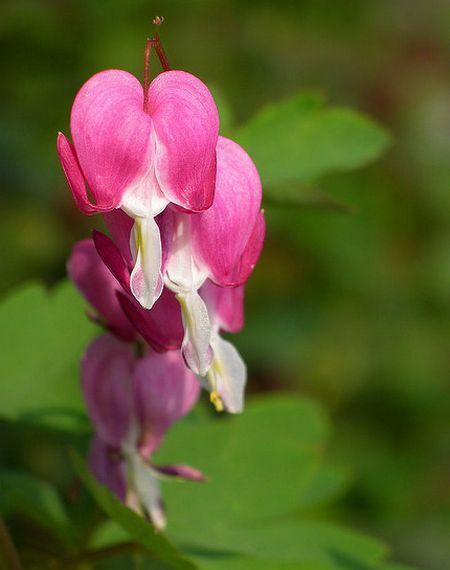 If planning to grow Dicentra outdoors from the off it is best to sow out the seed at the end of autumn or the beginning of winter, simply cover the seeds, or if you are growing bleeding heart from roots then they should be buried at a depth of about 6 or 7cm. The seeds should be planted into either a sunny or preferably a lightly shaded part of the garden that has a moist rich acidic soil (pH 5 to6). If planning to grow Dicentra indoors before transplanting, then the seeds will need to have a simulated winter. you can do this by placing the seed within soil in a plastic bag and freezing for about six or seven weeks. The soil/seeds should then be allowed to germinate at a temperature of 15 degrees; this can take anything from one to twelve months. Once growing the Dicentra seedlings should be transplanted outdoors with a spacing of about 30 cm (small species) or 60 cm (large) in either the spring or autumn. If you require more plants then Dicentra root cuttings can be took throughout the year, or they can be divided in the spring. 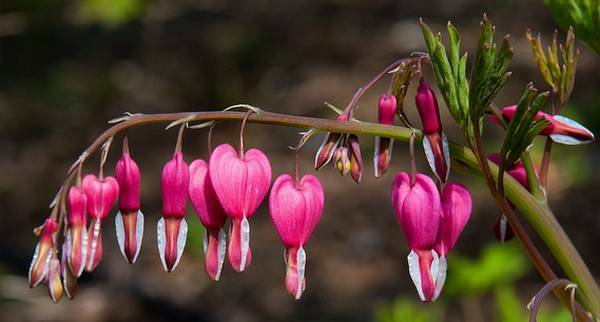 Bleeding hearts require both a light feeding and regular watering when they are growing.